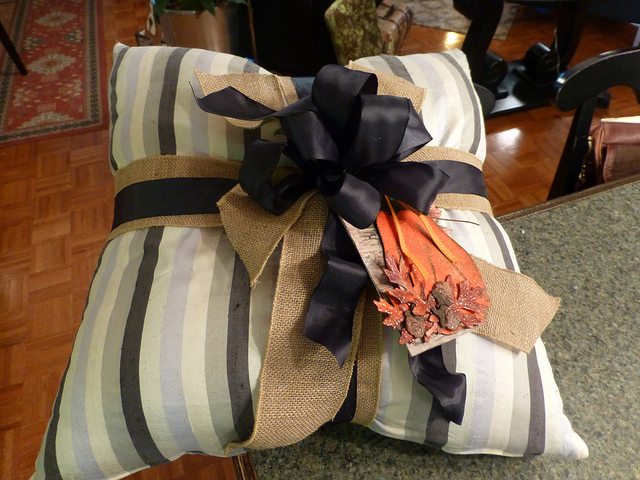 The Gentleman Crafter: Dressing Up An Old Pillow! 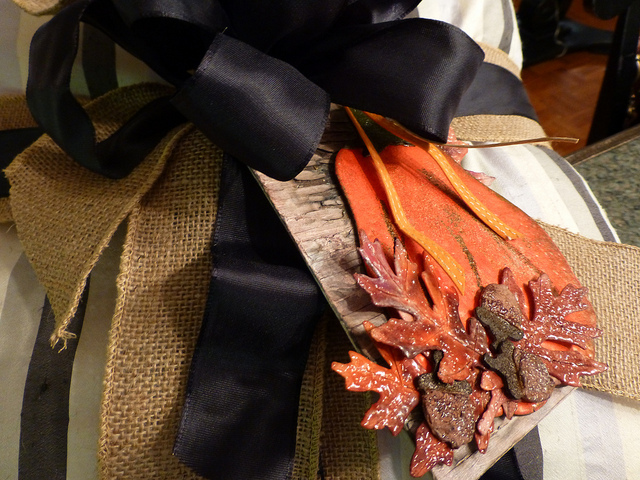 I used some burlap and black ribbon and added the tag Mom and I made when she was here last. Just looking over at it makes me happy and immediately brings back the fun memories we had on Labor Day! Hope you can get some ideas.....Thanks for looking! Nice pillow, beautiful bow and the tag....what can I say?! Besides being festive, that tag has sentimental value! Beautiful grouping!!! Love the pillow...simple, festive and elegant. Dang. I would love to see your house. Bet it is beautiful. I love the simplicity and the texture of that burlap ribbon. Sure I can't get you to come over and fix my house? You must still be taking your vitamins! You just go go go! Love the holiday decor! Very nice! Thanks for sharing this super idea!!! I love it and how simple and easy!! Very pretty....and the tag you and your mom made just adds that special touch! Love, love your vignette. I'm feeling inspired. A good touch adding your tag to that pillow. 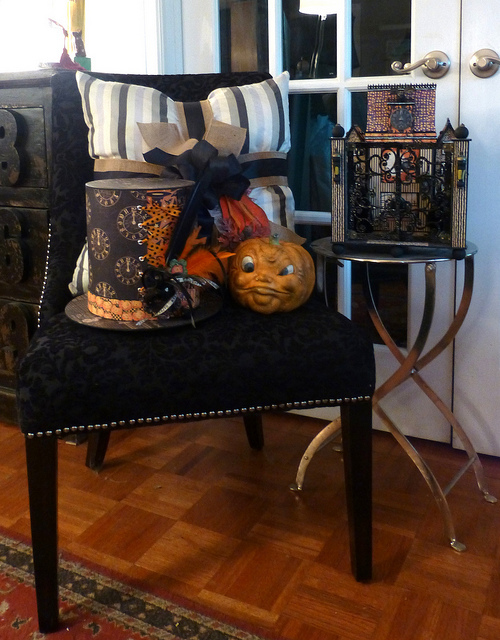 I adore the lil pumpkin sitting beside you awesome top hat. Can you come decorate my house . . . . . . please! Looks great! Love that you included something that brings back happy memories at a glance!! Love it! What a wonderful way to display the tag and your top hat. Very festive! This is genius! I'm going to do this on my sofa pillows. Thanks for another wonderful idea. You are the BEST! Love the pillow, it's the little things that make the room! Very nice! So good that you can think about your Mum every time you see your cushion.